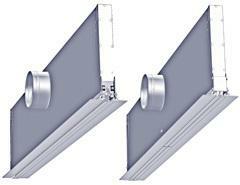 Slot diffusers are air supply elements which can be integrated relatively harmoniously in ceilings. They are suitable for air conditioning in large offices, training rooms, laboratories, passenger halls etc. They set themselves apart through unique discharge characteristics. - One, two or three discharge devices with adjustable vanes.